The basic design considerations for a spectrally-stable DBR semiconductor laser specifically designed for pulsing in the nanosecond regime is presented, along with test results from devices fabricated according to these design parameters. 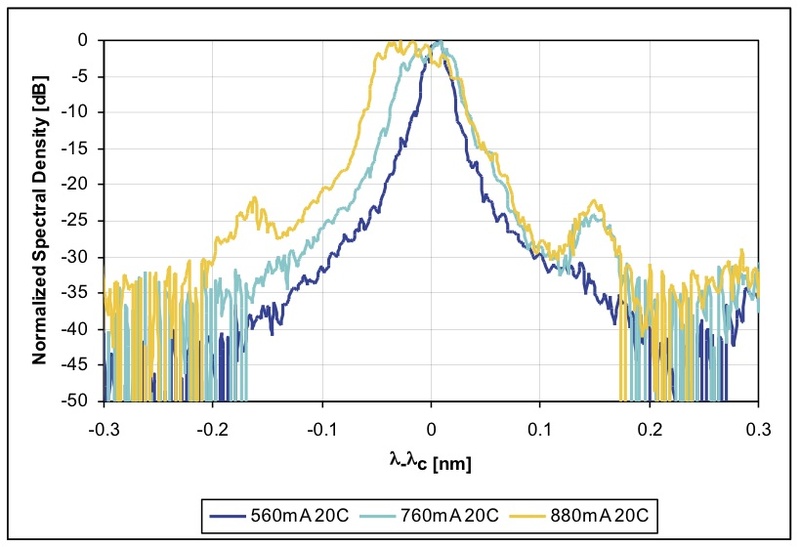 Results show excellent mode selection and spectral stability over an extremely large range of conditions, including temperature ranges of 15-60ºC and peak drive current ranges from threshold to 880 mA. These lasers exhibit peak output powers of greater than 500 mW for DBR semiconductor lasers at 976 nm and 1064 nm while remaining spectrally stable. Chirp data shows the chirp can be effectively tuned from approximately 1 GHz to greater than 20 GHz by varying the pulse width and peak drive current. Lasers capable of producing spectrally-stable optical pulses in the nanosecond regime are desired for a variety of application including metrology, frequency doubling, and material processing. Many of these applications demand extremely high peak power warranting the use of fiber amplifiers combined with seed lasers capable of producing spectrally-stable nanosecond pulses. Other applications require the maximum amount of power possible from a single device for the most cost effective solution. By properly designing a distributed Bragg reflector (DBR) semiconductor laser, a laser capable of lasing on a single-longitudinal mode can be fabricated that is also capable of several hundred milliwatts of peak power. This paper describes the basic consideration in the design of such a DBR semiconductor laser, as well as results from DBR lasers fabricated to achieve high-power spectrally-stable optical pulses in the nanosecond regime. In Section 2, the basic design consideration will be addressed. In Section 3, the experimental setup used to measure the spectral behavior of the fabricated devices will be described. In Section 4, the measurement results will be presented for both 976 nm and 1064 nm DBR semiconductor lasers, followed by a summary of the results in Section 5. The two key factors in the design of a nanosecond pulsed DBR laser diode are the reflection spectrum of the DBR and the length of the laser cavity. These two parameters are coupled in the design in that one parameter determines the other. The reflection bandwidth of the DBR grating is the first key factor; the reflection bandwidth is determined by factors including the proximity of the grating to the laser waveguide, the etch depth of the grating teeth, the grating duty cycle, and the grating shape. The reflection spectrum of the DBR grating can be simulated taking into account the previously mention parameters using the rigorous coupled wave analysis (RCWA) method described in . Using this method, DBR gratings with coupling coefficients, denoted as k, of 25 cm-1 and 200 cm-1 were simulated with an epitaxial structure similar to that used for the lasers tested for this paper. The reflection spectrum of the DBR grating with k = 25 cm-1 is shown in Figure 1 (a), and the reflection spectrum of the DBR grating with k = 200 cm-1 is shown in Figure 1 (b). The only parameter changed in these simulations was the etch depth of the grating teeth. For determining the mode spacing, we can assume that the effective refractive indices in the two separate regions are approximately equal since these values will not be significantly different. The effective grating length is the inverse of twice the coupling coefficient . The adjustment of the mode spacing will depend on the adjustment of the gain length since all other parameters are effectively fixed for a given DBR grating and epitaxial laser structure. In order to limit the choice of longitudinal lasing modes for the laser, the length of the laser cavity is chosen such that the mode spacing is greater than the reflection bandwidth of the DBR at full width half maximum (FWHM), as can be seen in Figure 1. For the DBR grating with k = 25 cm-1, a gain length of 750 μm was selected for the correct mode spacing. For the DBR grating with k = 200 cm-1, a gain length of 100 μm was selected for the correct mode spacing. This selection of the mode spacing will limit the possibility of the laser operating in more than one longitudinal mode. If the mode spacing is made considerably larger than the DBR reflection bandwidth, there is a possibility of having an extremely poor reflectivity of the DBR mirror which will seriously degrade the device performance. If the mode spacing is made too small, there is a high probability of different longitudinal modes being selected from pulse to pulse or of a mode hop occurring during the pulse. Therefore, obtaining spectrally-stable optical pulses requires this balance of mode spacing and DBR reflection bandwidth to be maintained. If high peak power is the goal, the laser cavity must be as long as possible. The longer cavity will yield a higher gain length, a lower current density for a given output power, and a lower thermal resistance, all of which is necessary for high power operation. Thus, the DBR will need to be fabricated with the narrowest reflection bandwidth possible while maintaining a high peak reflectivity to allow for the smallest mode spacing and longest cavity possible. Thus, the DBR must be designed and fabricated such that the reflection bandwidth is sufficiently small and, consequently, the shape of the reflection spectrum is rounded near the reflection peak, as seen in Figure 1 (a). The effective grating length must also be kept relatively short due to the absorption associated with this passive region; this effective length should be limited to 200 μm or less. The high-power spectrally-stable pulsed DBR laser diodes presented in this work were fabricated as described in , except that the gain lengths of these devices were 750 μm and careful attention was paid during the fabrication of the DBRs for these lasers to ensure the desired reflection spectrum. The experimental setup used to measure the spectral behavior of these DBR semiconductor lasers during pulsed operation consists of the electrical setup, which is used to drive the semiconductor lasers, and the optical setup, which is used to characterize the light output of the lasers. The Photodigm DBR semiconductor lasers were mounted on C-Mounts and pulsed using an Avtech Electrosystems AVO-6D-B Laser Diode Pulser. The lasers were driven at pulse widths ranging from 4 ns to 50 ns at a repetition frequency of 20 kHz, which is the driver’s maximum frequency. The electrical pulses were not ideal due to a small amount of ringing present in the pulses as shown in Figure 2. The laser under test was temperature controlled with a TEC driven by an ILX LDT-5910B Temperature Controller. Figure 2. 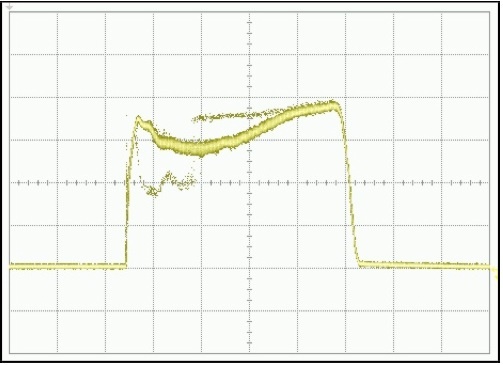 4 ns and 50 ns electrical pulse from Avtech monitor. The laser light from the DBR laser was collimated with an aspheric lens and coupled into an unbalanced Michelson interferometer as shown in Figure 3; unbalanced meaning that the arm lengths are slightly different to provide a slight delay for light in one arm with respect to the other arm. The delay allows for two different portions of the pulse to interfere with one another. As the source wavelength changes, the intensity of the interference will change accordingly, thus providing a wavelength sensitive monitor. 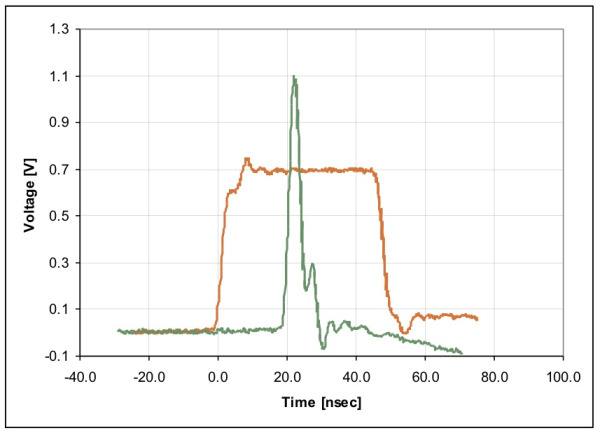 The light at the interferometer output was coupled into a single mode HI-1060 optical fiber with FC/APC connectors and analyzed using an Agilent Infinium DCA 86100A Wide-Bandwidth Oscilloscope. This oscilloscope is equipped with a 20 GHz optical/electrical 86105A module. The oscilloscope was used in eye diagram mode to capture a very high number of pulses to get a statistical overview of the distribution of the laser modes. An interferogram for a non-ideal device is shown in Figure 4 as an example. This example illustrates both inconsistent mode selection from pulse to pulse, as well as a mode hop during the pulse. Figure 3. Unbalanced Michelson Interferometer for monitoring spectral behavior during pulsed operation. Figure 4. Non-ideal device showing a secondary mode being selected with a low probability; further, this secondary mode has a very apparent mode hop. Figure 5 is the optical pulse measured with one arm of the interferometer blocked for a variety of pulse widths. The roundedness near the rising and falling edges comes from the rise and fall times associated with the laser diode driver used. The gain-switching spike on the rising edge of the pulse is inherent to semiconductor lasers; however, this spike can be virtually eliminated through pre-biasing the laser to just below threshold. The ringing from the electrical pulse is very apparent in the optical pulses longer than 8 ns. The same optical setup was also used to record the optical spectrum during pulsed operation. This was accomplished by blocking one arm of the interferometer and moving the fiber end to an Ando AQ6317 Optical Spectrum Analyzer (OSA) to record the optical spectrum. The resolution setting on this OSA was set to the minimum of 10 pm. The measurements presented in this section are from two different laser types. The first is a Photodigm 976 nm DBR semiconductor laser and the second is a Photodigm 1064 nm DBR semiconductor laser. The measurements presented here were taken from a typical Photodigm 976 nm DBR semiconductor laser with 750 μm gain length. At a peak current level of 560 mA (~425 mW) and a 50ns pulse width the interferogram shows no sign of a secondary mode or any competition between modes for temperatures ranging from 15ºC to 60ºC; a few samples at different temperatures of the interferograms at this peak current level are shown in Figure 6. In Figure 6, it is worth noting again that these interferograms are wavelength dependent traces; the amplitude of the interferogram has no absolute relation to the actual peak power of the pulse (i.e. the reduction in interferogram amplitude as temperature increases in this series is purely coincidental). Figure 7 shows the spectrum as measured by the OSA for this device at 560 mA at 20ºC and 35ºC. This device maintained excellent mode selection and spectral stability for peak drive currents ranging from threshold to 870 mA for the temperature range of 15ºC to 60ºC. For this device, the pulse remains stable until near 880 mA for a 50 ns pulse at 20ºC (~660 mW) at which point the interferogram becomes irregular. At this current, the optical pulse from a single arm of the interferometer is irregular, as seen in Figure 8. Presently, it is unclear exactly what is causing this optical pulse breakdown at this high power level. This optical pulse breakdown is some sort of induced modulation that is accompanied by significant spectral broadening, but the devices typically retain a single spectral mode as measured by an OSA. The precise point at which this pulse breakdown phenomenon occurs is device dependent. Below the current level of 880 mA, the device maintains excellent mode selection as seen in Figure 9. The interferogram shown in Figure 9 was taken at a peak current of 760 mA (~570 mW); the small steps in the pulse correspond to the ringing of the electrical pulse. The interferogram becomes very wavy right before the onset of the optical pulse breakdown seen in Figure 8, and the spectrum as measured by the OSA becomes broader as seen in Figure 10. The broadening of the spectrum for increasing current levels can clearly be seen in Figure 10. The point at which the pulse breakdown occurs is pulse width dependent. The breakdown typically starts at the falling edge of the pulse and moves toward the beginning of the pulse as the peak current is increased further. Therefore, shorter pulse widths often times have a higher usable peak current or peak power than longer pulse widths. This is evident in the interferogram for the 976 nm DBR semiconductor laser shown in Figure 11; for this 4 ns pulse width, the peak current is extended to just below 1000 mA or approximately 700 mW peak power. A noticeable trait of the interferogram in Figure 11, is that the there are two valleys in the trace. These two valleys indicate that the wavelength is changing quite significantly during the pulse. 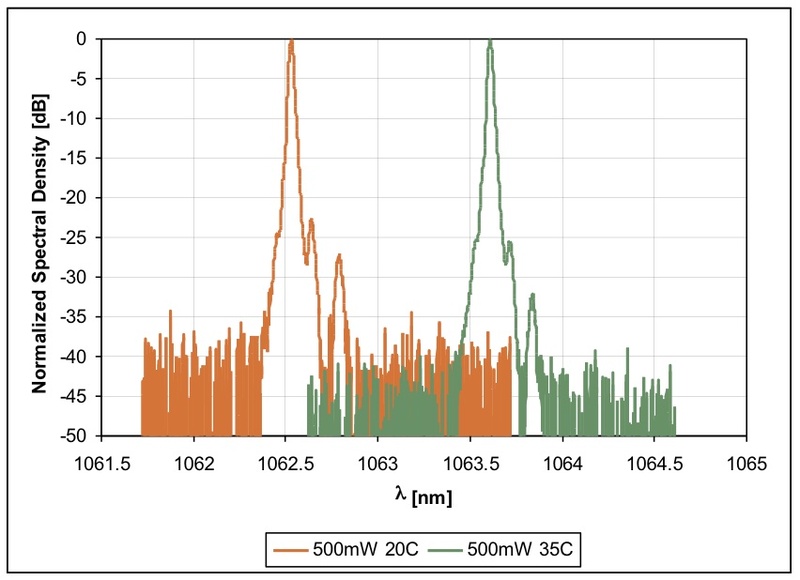 In order to gauge the chirp or broadening of the spectrum with peak current, the OSA spectrum was recorded for several peak current levels for the 976 nm DBR semiconductor laser under test. The width of the optical spectrum was determined at full width half maximum from the OSA spectrum. This width was reduced by the spectral width for CW operation (effectively subtracting away the point spread function of the OSA). The chirp was then calculated based on this number. 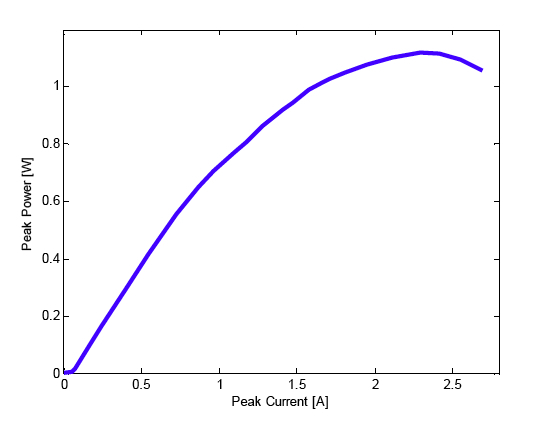 The chirp values calculated by this method for a 50 ns pulse as a function of peak drive current are shown in Figure 12 (a); the slightly higher chirp value at lower currents comes from the Avtech laser driver. The top of the pulse has a slope with a slight increase at low drive currents. This measurement was also carried out for a fixed current and various pulse widths. 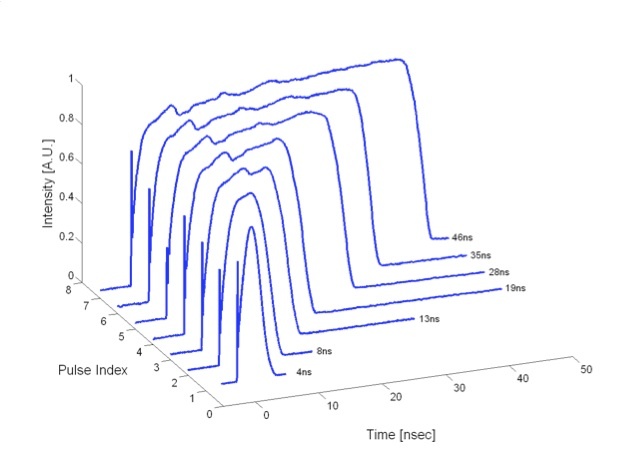 The chirp values resulting from these measurements are shown in Figure 12 (b). The chirp for the 625 mA peak current versus pulse width shows a trend that is most likely explained by the slow rise and fall times of the laser diode driver for the shorter pulses. Since the instantaneous frequency of the laser is varying over the entire pulse, the measured optical spectrum will be significantly broader. As the pulse starts to have a flat top, the instantaneous frequency will have a more centralized distribution around the frequency corresponding to this steady state area. However, as the pulse becomes longer the instantaneous frequency will begin to change during the flat top of the pulse due to heating effects at these high current levels and longer pulse widths. If the application requirements are lenient in terms of power or pulse width, the ability to vary the chirp by changing the peak drive current or pulse width can be useful in obtaining the desired chirp for the application. Figure 12. (a) Approximate chirp versus peak current for a 50 ns pulse, and (b) approximate chirp versus pulse width for a peak current of 625 mA. The measurements presented here were taken from a typical Photodigm 1064 nm DBR semiconductor laser diode. For this device, the pulse remains stable until just past 700 mA for a 20 ns pulse at 20ºC (~500 mW) at which point the interferogram becomes irregular. At a peak current level of 700 mA (~500 mW) the interferogram shows no sign of a secondary mode or any competition between modes for temperatures ranging from 15ºC to 60ºC; a few samples at different temperatures of the interferograms at this peak current level are shown in Figure 13. Figure 14 shows the spectrum as measured by the OSA for this device at 700 mA at 20ºC and 35ºC. This device maintained excellent mode selection and spectral stability for peak drive currents ranging from threshold to 700 mA for the temperature range of 15ºC to 60ºC. For shorter pulses, the maximum usable peak current was increased significantly. For a 4 ns pulse, the peak usable current was extended to 850 mA or approximately 600 mW peak power. An interferogram at 4 ns for 850 mA peak drive current is shown in Figure 15 (a), with the optical spectrum at the same operating conditions shown in Figure 15 (b). Some devices have a little noise immediately following the gain switch peak, as seen in the interferogram in Figure 15 (a). 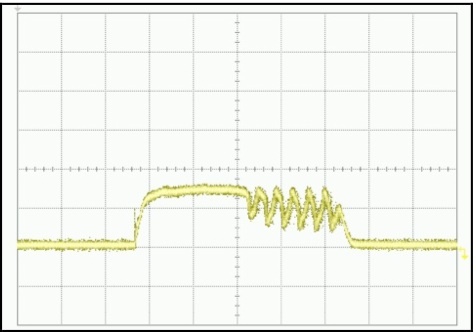 This noise is present in the optical pulse and stems from the process of the device finding equilibrium with the correct laser cavity mode after the gain switch peak. This noise is present immediately following the gain switch peak and typically subsides in less than 400 ps. Figure 15. (a) 1064 nm DBR semiconductor laser interferogram for 4 ns pulse with 850 mA peak current at 35ºC (x-axis 1 ns/div, y-axis A.U. ), (b) 1064 nm DBR semiconductor laser optical spectrum in dB scale at 4 ns, 850 mA peak drive current, and 35ºC. 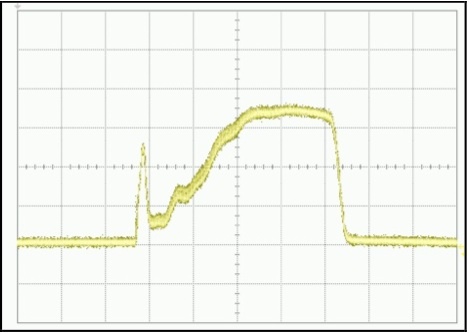 The light-current characteristic curve was taken for this device under pulsed operations to see how the power output rolled off with drive current. This curve, shown in Figure 16, was taken at a pulse width of 15 ns and a repetition rate of 10 kHz. The slope efficiency begins to significantly rollover at a peak drive current of 800 mA, which is very near the operating currents at which the optical pulse breakdown occurs. Figure 16. 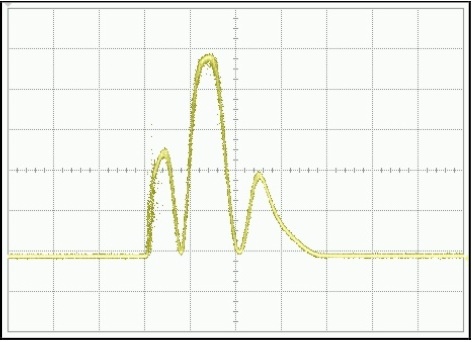 Light-current characteristic curve for a 1064 nm DBR semiconductor laser. We have presented the basic requirements that need to be addressed in the design of a nanosecond pulsed DBR laser diode. These lasers exhibit pulses in which the mode selection takes place within the first 400 ps after the gain switch peak. After mode selection, these lasers remain spectrally stable operating on a single longitudinal mode for the remainder of the pulse. Four nanosecond pulses exhibiting excellent spectral performance with drive currents of up to 970 mA, corresponding to a peak power of approximately 700 mW, have been demonstrated for a 976 nm DBR semiconductor laser and drive currents up to 850 mA, corresponding to a peak power of approximately 600 mW, have been demonstrated for a 1064 nm DBR semiconductor laser. 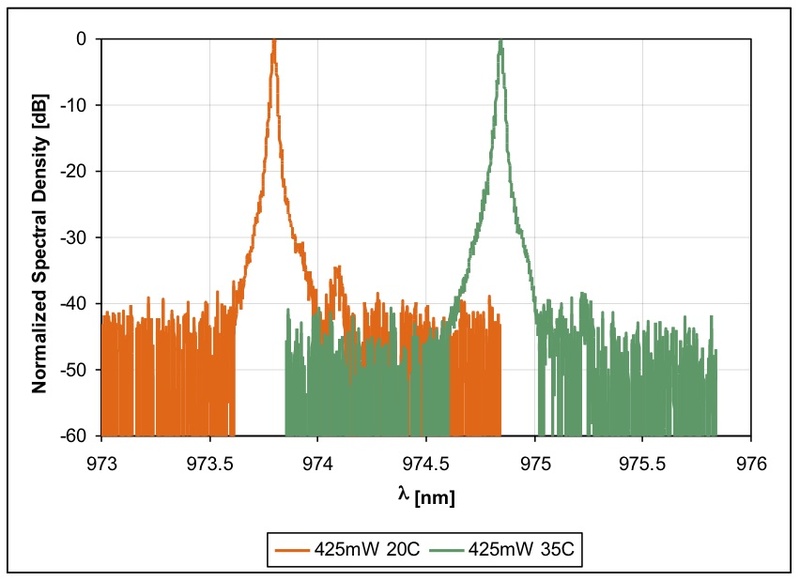 Performance is lower for pulses of 20 ns or longer, with peak drive currents in excess of 700 mA or approximately 500 mW being demonstrated for both 976 nm and 1064 nm DBR lasers. Furthermore, excellent mode selection and spectral stability is maintained spanning temperature ranges better than 20ºC to 50ºC and drive currents from threshold to greater that 700 mA. Chirp data has also been presented and shows that the chirp can be effectively tuned from approximately 1 GHz to greater than 20 GHz by varying the pulse width and peak drive current. The authors thank N. Amarasinghe, R. Mangham, D. Phan, D. Cloud, P. Young, and J. Perez for device processing and fabrication. This work was paid for by the National Science Foundation under STTR Phase II Grant # 0848649. Silberstein E., Lalanne P., Hugonin J., and Cao Q., “Use of grating theories in integrated optics,” Journal of the Optical Society of America A, 18, pp. 2865- 2875, 2001. Coldren, L. A., and Corzine, S. W., [Diode Lasers and Photonic Integrated Circuits], John Wiley & Sons, Inc., New York, (1995). 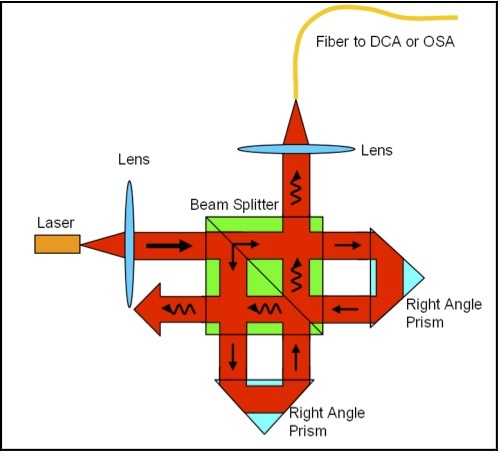 Achtenhagen, M., Amarasinghe, N. D., Jiang, L., Threadgill, J., and Young, P., “Spectral Properties of High-Power Distributed Bragg Reflector Lasers,” Journal of Lightwave Technology 27(16), 3433-3437 (2009).